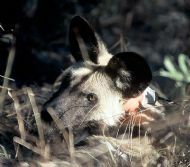 Painted Dog Conservation is considered by many to be a model for conservation. 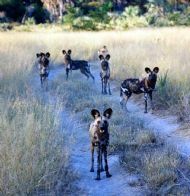 Our vision is to create an environment where the painted dogs can thrive. Conservation through Action and Education is our mantra. 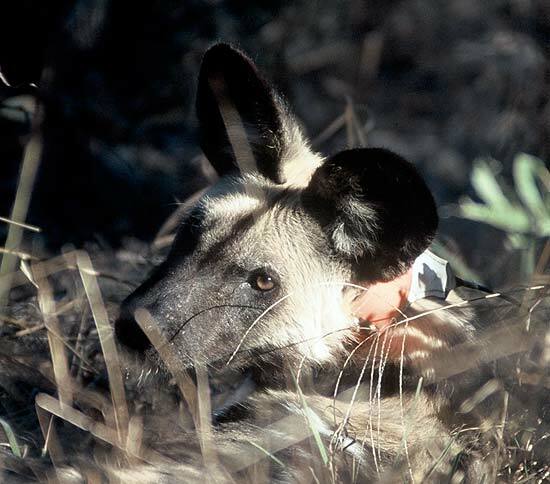 The loss of quality habitat and poaching are driving the painted dogs towards extinction. Consequently we have implemented an Education & Development Program that targets the local communities in our core operating area. 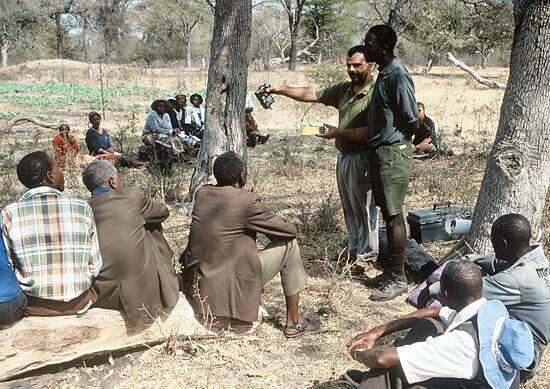 Direct action strategies such as anti-poaching units and a rehabilitation facility have been developed to combat the ever present threat from poaching. Our Visitors Centre teaches local and international visitors about the plight of the painted dogs and the Hwange ecosystem as a whole. We believe that conservation needs to deliver tangiable benefits to local communities that share their daily lives with the wildlife. 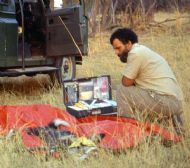 Such benefits will bring attitudinal change that in turn can be leveraged into necessary behavioural change that will lead to the desired environement where the painted dogs and all wildlife can thrive. 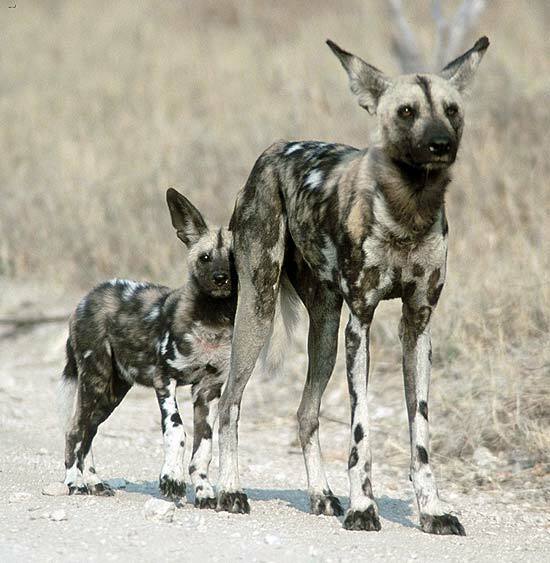 Zimbabwe is the only country in Africa to see a painted dog population increase in the last ten years. With a strong commitment to community development and conservation education, our methods are working, but we rely totally on the generosity of individuals and organisations alike to continue our work. Please be generous. 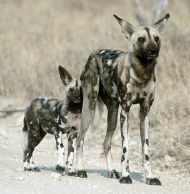 Want to contact Painted Dog Conservation, Zimbabwe? Use the contact details on their site. To achieve this we currently employ 55 local people in the following programme areas. Anti Poaching Units: Our APU undertake daily patrols providing direct protection for the painted dogs, while at the same time making a significant contribution to Biodiversity, by protecting their habitat and the species they coexist with. Rehabilitation Facility: Allows PDC to deal with any eventuality concerning injured or orphaned individual painted dogs or the translocation of entire packs from problem areas. Children’s Bush Camp: Teaches conservation concepts while promoting an emotional attachment to nature that will lead to a lifelong attitude of caring for it. Visitor Centre: Features an Interpretive Hall, which teaches visitors about the greater Hwange ecosystem, the plight of the painted dog and the significance of biodiversity. PDC has established Conservation Clubs at the local schools as an extension of our successful Children’s Bush Camp programme, the clubs undertake both practical and theoretical exercises such as tree planting, clean up campaigns, drama and poetry performances, which benefit their communities at large and further enhance and appreciation for and understanding of the environment. Iganyana Arts Centre: The Centre provides an income generating opportunity for an average of 25 artisans each day, who make unique crafts from reclaimed and recycled materials, including wire from snares removed from the bush by our Anti-poaching Units. Community Gardens: The aim is to improve nutrition and food security. PDC provides direct funding for or facilitates the drilling of bore holes to provide clean reliable water for communities, which in turns allows for the establishment of nutritional gardens. PDC facilitates the establishment of income generating projects such as bee keeping, chilli growing and the garden projects mentioned above, with the aim of improving the livelihoods of individuals and their families alike. HIV/AIDS. PDC arranges for and supports St Patricks Hospital, to established monthly counselling and testing clinics for our staff and the surrounding communities, to encourage people to live a healthier life style. PDC sponsors the local soccer league to engage the areas youth in a meaningful, motivational and healthy pursuit. Gallery: Click on the images to view a larger version in a pop-up window. 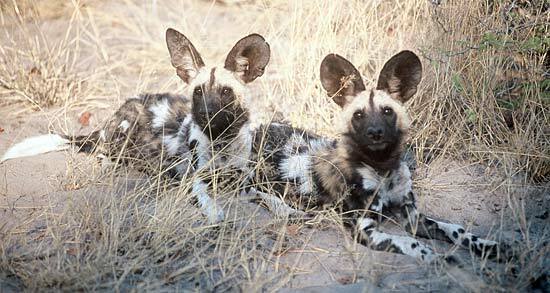 Most of these images were taken by Peter Blinston of the Painted Dog Conservation. Researchers give each dog an individual name to aid recognition, often based on their coat markings. Greg Rasmussen treating an injured wild dog. Costs are high, so your donations are much needed and appreciated. Mortality rates are high. 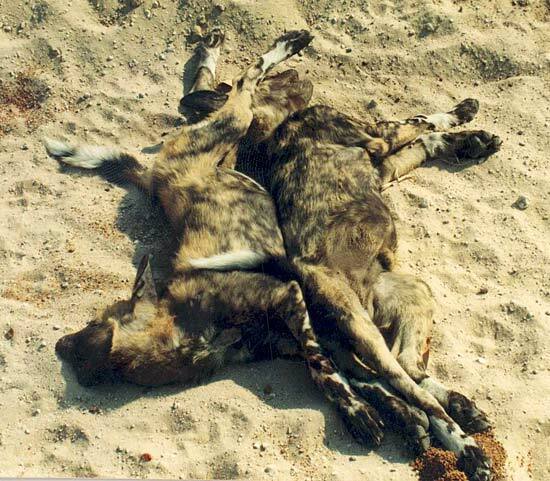 As well as natural dangers, Wild Dogs are often killed by illegal snaring, trapping and poisoning. If the Painted Dog is to survive, then attitudes to them must be changed, especially amongst farmers. 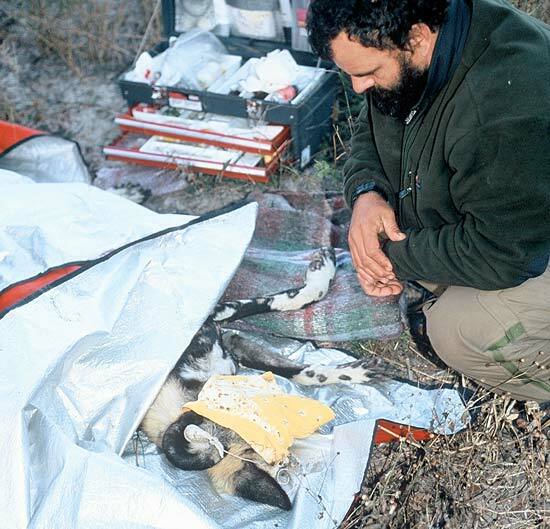 Much demonised by Man, education is helping to improve the Wild Dog image. 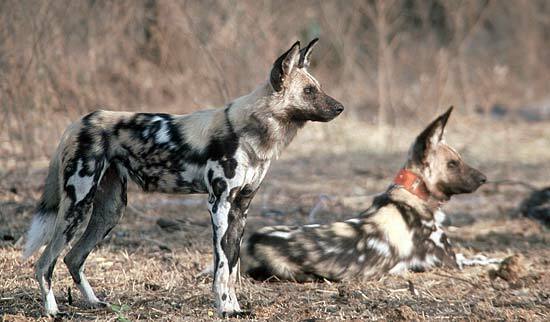 Many Painted Dogs are killed through indiscriminate and illegal snaring. Protective collars can be fitted, but are very expensive. Please make a donation to help. The dog behind is fitted with an anti-snare collar - expensive to fit, but life-saving.